Wise Care 365 includes both Wise Disk Cleaner and Wise Registry Cleaner. However, with other attractive and exciting features, it is far more than just that. Wise Care 365 will keep your PC in tiptop shape and running at peak performance! Wise Care 365 can detect more hidden invalid registry issues than CCleaner, which is accredited by CHIP and PCWorld. It takes just one click to use Wise Care 365. As if by magic, your old PC will transform into a brand new and blazing fast one after Wise Care 365’s automatic cleanup and tune-up. The scanning speed of Wise Care 365 is twice as fast as CCleaner’s, as well as Advanced System Care Pro 5. All the features in Wise Care 365 are highly reviewed by PCWorld, PCAdvisor, ComputerBild, CHIP, CNET, ZDNet, and so on. A group of top programmers, all of whom have at least ten-years experience, spent three years creating Wise Care 365 after collecting an abundance of feedback from users. Wise Care 365 is a bundle of important registry, disk, and other system utilities for your PC. Easy to use and effective, Wise Care 365 is the best solution to improve your PC’s performance. Get Wise Care 365 and your computer will never run slow again! One Click A Day For PC Maintenance, Keeps Any PC Problems Away. With millions of worldwide users, the first-rank & free Glary Utilities is an INDISPENSABLE friend for your PC, with its 100% safe, thorough & quick cleaning and worry-free restoration. Glary Utilities is a freeware with registry and disk cleaning, privacy protection, performance accelerator and amazing multifunctional tools. It can fix dogged registry errors, wipe off clutters, optimize internet speed, safeguard confidential files and maintain maximum performance. Glary Utilities is the #1 free, powerful and all-in-one utility in the world market! It offers numerous powerful and easy-to-use system tools and utilities to fix, speed up, maintain and protect your PC. Software Update is a free software client designed to inform you of available software updates for your computer, so as to keep your software up-to-date. Software Update scans your computer and notify you if there is a program hasn’t been updated to the latest version. It offers you a link to update software and other related information. 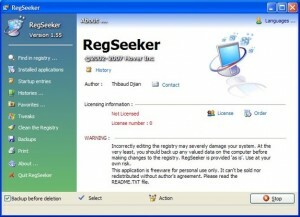 RegSeeker is a perfect companion for your Windows registry. RegSeeker includes a powerful registry cleaner and can display various informations like your startup entries, several histories (even index.dat files), installed applications and much more ! With RegSeeker you can search for any item inside your registry, export/delete the results, open them in the registry. RegSeeker also includes a tweaks panel to optimize your OS ! Starter allows one to view and manage all the programs that are starting automatically whenever operating system is loading. It enumerates all the hidden registry entries, startup folders’ items and some of the initialization files, so that the user could choose to temporarily disable selected entries, edit them, create new, or delete them permanently. Secondary purpose is to list all the running processes with possibility to view extended process’ information (such as used DLLs, memory usage, thread count, priorities etc. ), and to terminate selected process (even a Windows NT service, having enough access rights). Another one is Windows’ services (and drivers) manager with some advanced features. 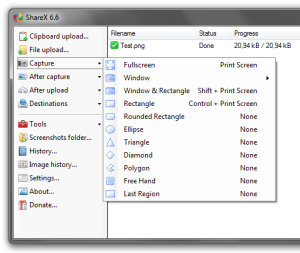 Starter is a real Freeware and is not crippled in any way among the similar products. The user interface is pretty simple and has a lot of options that are self-explanatory. CleanMem keeps memory use in check on the system without the memory being pushed to the page file. This in turn keeps the system running smoother. CleanMem itself is totally free. When you install CleanMem it will auto run every 15 min by the Windows Task Scheduler. Once installed it is set it and forget it. Just as it always has been. You can configure CleanMem to do more advanced things such as ignore lists, only lists, and log files. These can be set by the CleanMem Settings program in the start menu. 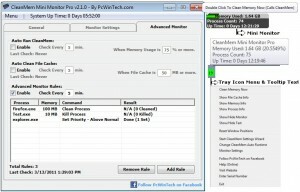 The Mini Monitor is the only part of CleanMem that is the Free/Pro. All features in the mini monitor from v1.7.0 are included and still free, including some new features that where added as well. One very important thing is that there are no nag screens in the free version of the mini monitor and no pop ups asking you to upgrade to pro or anything like that. So the free version is still as helpful as it was before and the pro version adds more control and options for the power users. Windows Repair is an all-in-one repair tool to help fix a large majority of known Windows problems including registry errors and file permissions as well as issues with Internet Explorer, Windows Update, Windows Firewall and more. Malware and installed programs can modify your default settings. With Tweaking.com – Windows Repair you can restore Windows original settings. Want to clean and optimize your PC? You’ve probably heard of CCleaner, arguably the world’s most popular tool for doing the job. It clears out temporary files, cleans the Windows Registry, erases browser histories, and so on. CCleaner includes the option to install Google Chrome and make it your default browser. You will have to uncheck two checkboxes if you don’t want this to happen. This program is donationware. It is free to try, but the author accepts and encourages donations towards further development.